Tue.-Thu. 10 a.m.-8 p.m.; Fri, 10 a.m.-9 p.m.; Sun. 8 a.m.-7 p.m.
To paraphrase Shakespeare: Let us not to a marriage of true palates admit impediments. Not even the distance from Pittsburgh to Atlanta could keep apart caterer Jim Evans (specialty: pig roasts) and his future wife Jen, a childhood-friend-turned-Georgia-pastry-chef. 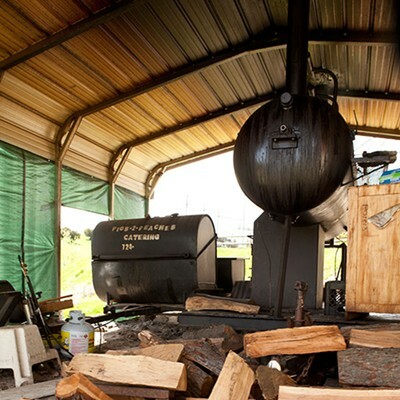 Linked by a mutual passion for Southern-style barbecue, the couple reconnected long distance, and the gravity of Western Pennsylvania drew them to a semi-rural corner outside the charming hamlet of New Brighton. 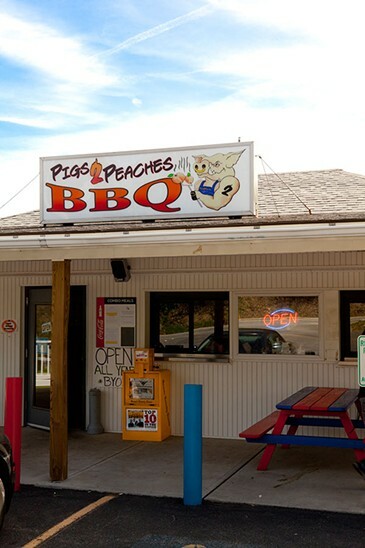 Unlike most barbecue places, Pigs-2-Peaches doesn't limit its menu to a list of meats and sides. It's actually more reminiscent of a diner, complete with breakfast, sandwiches and burgers for lunch, and — as the name suggests — homemade desserts aplenty. 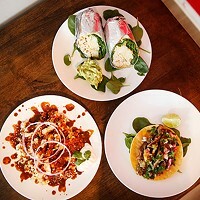 We felt that brunch was the best way to get the lay of this sprawling culinary land. Brunch can resemble dessert, especially if you order pancakes, as did everyone in our party under the age of 10. Truth be told, we adults had a hard time keeping our forks off them, because they were quite good: perfectly browned on the outside, light but not too cakey inside, and amply filled with banana or peach slices, blueberries or chocolate chips. We were also pleased to find the accompanying breakfast sausage top-notch and unapologetically meaty. If you want maple flavor, there's a syrup bottle on the table. Four beautifully slow-cooked meats filled the barbecue platter: pulled chicken, pulled pork, brisket and ribs. All but the chicken were served unadorned, while the extraordinarily juicy white meat was flecked with mere hints of rosy sauce. Juiciness was theme throughout, with the sliced brisket standing out for a perfect proportion of melted fat that added a delectable, silky mouthfeel. 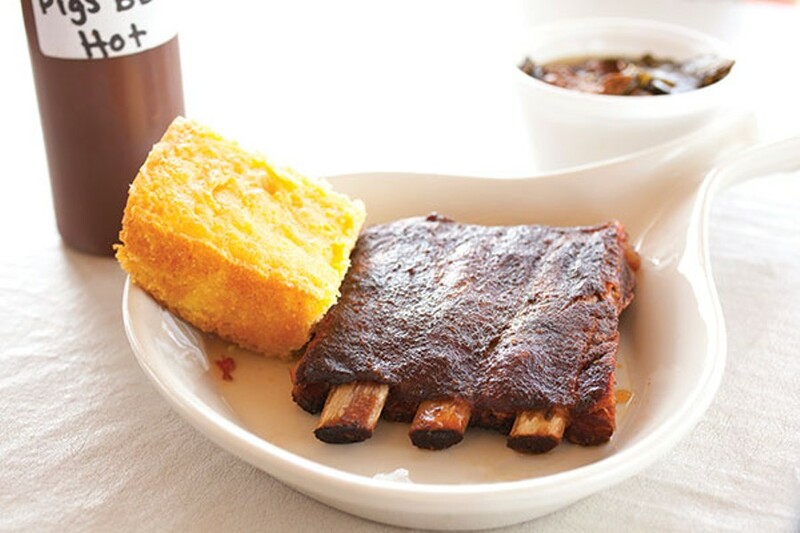 The biggest success, however, were the ribs, which appeared to be the desirable St. Louis cut: bigger and more flavorful than baby-backs, but not as unwieldy as an untrimmed rack. The meat was gloriously pink (from the wood-smoking process, not undercooking) and hit that perfect balance between falling off the bone and retaining satisfying chew. The surface was flavorful from the rub and the smoke, but also welcomed saucing. As has become the welcome norm, Pigs-2-Peaches offers a caddy of sauce options, from Carolina Mustard to Texas Smoky. Truthfully, some of these were unremarkable. The Carolina tasted mostly of yellow mustard, while the Georgia Vinegar was surprisingly thick and not especially tangy. But the Texas sauce earned its smoky moniker, and the Peaches Sweet was beautifully balanced, with enough vinegar tang to keep the sugar from becoming cloying. 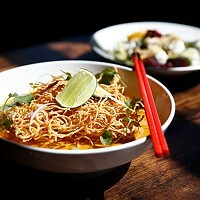 Fiery Pig offered something similar, but tilted toward the hot end of the spectrum. It being brunch, Jason also ordered, a bit sheepishly, a side of biscuits and gravy to go with his four-meat platter. Sheepishness turned into shock when one of those big skillet-style plates arrived loaded with creamy white gravy. Had he received the full order by mistake? No, this was the side; the full order is even bigger! 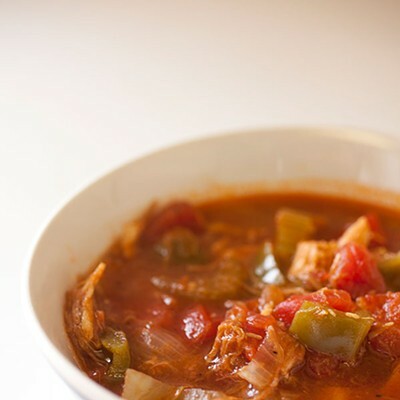 What he was able to put away was satisfying, the gravy filled with chunky crumbles of that good, meaty sausage over top of a biscuit that served the purpose, even if it was a bit too bready by plain-biscuit standards. 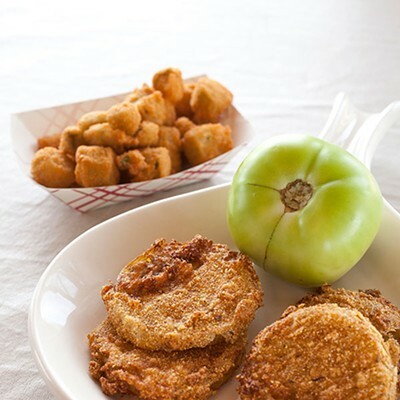 Our other, more modestly sized side dishes, fried green tomatoes and fried okra, boasted a crispy, bread-crumb batter that was good on its own and even better dipped in sauce. For her main dish, Angelique went with the barbecue-pork-and-greens casserole. The addition of eggs, cheese and a pastry-like crust gave it the character of an upside-down quiche, and like quiche, its flavor was mild, and its texture creamy and fluffy. Most people would not consider brunch an occasion to order dessert, but since Pigs-2-Peaches' homemade desserts set it apart, we threw caloric caution to the wind. Jen Evans draws on her pastry-chef background to create new desserts daily. Her sundaes, puddings, pies and brownies are the sweet versions of country comfort food. We opted for peach cobbler, emblematic as it is of the restaurant's name and origins. 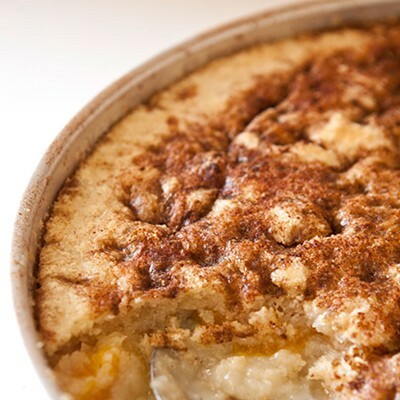 It is certainly not peach season, but the preparation compensated with good brown-sugar flavor and a crust that resisted sogginess despite plenty of peaches-and-cream "gravy." 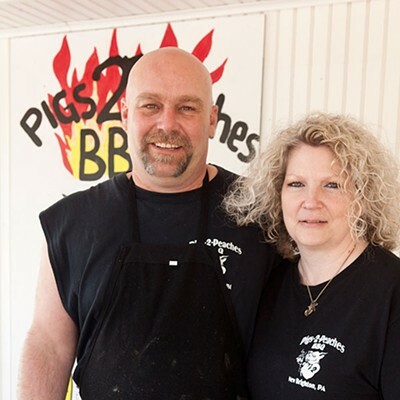 Pigs-2-Peaches embodies not only the partnership of two people who love to cook, but of country-barbecue and city-diner traditions.